Hello friends, welcome back to hackerwalablog. 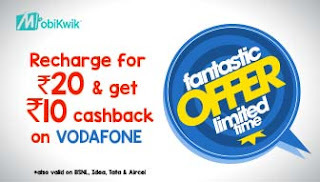 Mobikwik a online recharge site has again come up with a new loot offer, Get Rs 10 cash back on recharge of rs 20, this offer is for limited period only, so hurry grab this offer. Mobikwik coupons are below. 1- Sign Up Platform,Coupon Redemption and Payment should be done on MobiKwik's Android,IOS App and Website. 2- Offer can be Redeemed Only Once Per User during the Offer Period. 1- Sign Up Platform ,Coupon Redemption and Payment should be done on MobiKwik's Android,IOS App and Website.